See the web appendix referenced in the book. 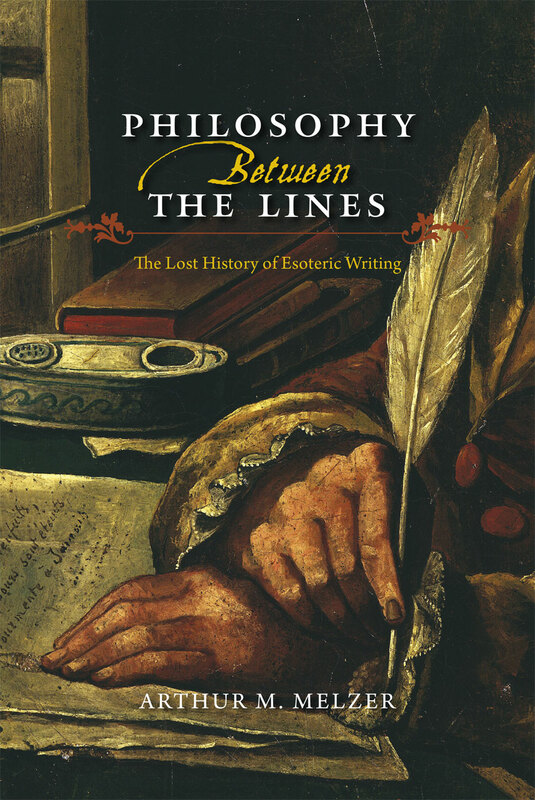 Philosophical esotericism—the practice of communicating one’s unorthodox thoughts “between the lines”—was a common practice until the end of the eighteenth century. The famous Encyclopédie of Diderot, for instance, not only discusses this practice in over twenty different articles, but admits to employing it itself. The history of Western thought contains hundreds of such statements by major philosophers testifying to the use of esoteric writing in their own work or others’. Despite this long and well-documented history, however, esotericism is often dismissed today as a rare occurrence. But by ignoring esotericism, we risk cutting ourselves off from a full understanding of Western philosophical thought. Arthur M. Melzer serves as our deeply knowledgeable guide in this capacious and engaging history of philosophical esotericism. Walking readers through both an ancient (Plato) and a modern (Machiavelli) esoteric work, he explains what esotericism is—and is not. It relies not on secret codes, but simply on a more intensive use of familiar rhetorical techniques like metaphor, irony, and insinuation. Melzer explores the various motives that led thinkers in different times and places to engage in this strange practice, while also exploring the motives that lead more recent thinkers not only to dislike and avoid this practice but to deny its very existence. In the book’s final section, “A Beginner’s Guide to Esoteric Reading,” Melzer turns to how we might once again cultivate the long-forgotten art of reading esoteric works. Philosophy Between the Lines is the first comprehensive, book-length study of the history and theoretical basis of philosophical esotericism, and it provides a crucial guide to how many major writings—philosophical, but also theological, political, and literary—were composed prior to the nineteenth century. Introduction: What Is Philosophical Esotericism? “Philosophy Between the Lines offers the best statement on this topic that there is. Melzer makes clear that the topic is important and his book is so well-written, cogently argued, and thoroughly researched that it will be of great interest to readers in intellectual history, history of philosophy, and all related disciplines." "This is a book scholars have needed for a long time. There has been so much more heat than light in the contentious debates about esoteric writing since Leo Strauss tried to reanimate attention to the phenomenon in the 1930s that it is surprising that no one has tried to set out carefully the various aspects of the rhetorical practice and to compile the evidence that it not only existed but was a prominent feature of philosophical writing until the nineteenth century. Melzer has finally done this; lucidly, patiently, and in a graceful conversational style. But he goes much farther. His book is philosophical as well as scholarly. It goes to the issue of late modern self-understanding itself, what we care about and what one might call our collective psychological relationship to the issue. No one even remotely interested in the topic of philosophical writing can afford to ignore this book. It is a major achievement and the sort of book that anyone can both strongly disagree with and at the same time be very grateful for." "Philosophy Between the Lines is a treasure-house of insight and learning. It is that rare thing: an eye-opening book. It is candid about secrets, and there is no book like it. Melzer succeeds in his aim of showing that until the Enlightenment, almost all philosophers wanted to be understood by only a few and were worried that if they spoke all the truth they knew they would suffer persecution or contribute to the demoralization of society. Without an awareness of the esoteric strategy, we would not know how to understand the course of speculation from Plato onward. Melzer lights up every issue he examines. By making the world before Enlightenment appear as strange as it truly was, he makes our world stranger than we think it is." "Starting from the seminal work of Leo Strauss, Melzer has given us, in lucid prose, the most comprehensive explanation and defense of the practice of esoteric writing we have. For Melzer, the overall function of esotericism is to make it possible for the reader to release him or herself from unconsciously accepted self-delusions: it is the basis of the ’realm of freedom.’ Melzer distinguishes several forms of esotericism—defensive (evading censorship or persecution), protective (of ’dangerous truths’), pedagogical (the need to pass through obscurity in order to see clearly), and political (the production of a harmony of theory and praxis). It is necessarily left to the reader of this excellent work to decide if Melzer has written an exoteric or esoteric book. After all, after the condemnation of his Emile, Rousseau (about whom Melzer has written a fine volume) once wrote in a draft of a letter to the Archbishop Beaumont: ’In truth, there are no more secrets to keep, nor truths to silence.’ A book that will call one out." "The best book I know on esoteric writing and its history." “Good prose strives to be clear and direct. Or so we all think now. Melzer’s remarkable book shines a floodlight on a topic that has been cloaked in obscurity: esoteric writing. . . . Philosophy Between the Lines is a double achievement, a landmark work in both intellectual history and political theory. For the reader who is in the habit of underlining, be prepared to have a second pen on hand as your ink will run dry by mid-volume." "The most important book published in political philosophy in years is Melzer’s Philosophy Between the Lines." "Significantly advances our understanding of the theory and practice of esoteric philosophical and political writing."